Forming Hearts and Minds. Proclaiming Jesus Christ. All of Christ’s faithful share in a common priesthood through baptism. From among them, the Church calls and ordains men to share specially in Christ’s priesthood. In the Old Covenant, even though Israel was a kingdom of priests (Exodus 19:6), the Lord called certain men to a special priestly ministry (Exodus 19:22). In the New Covenant, even though Christians are a kingdom of priests (1 Peter 2:9), Jesus calls certain men to a special priestly ministry (Romans 15:15-16). This Sacrament is called Holy Orders. Through it priests are ordained and thus empowered to serve the Church (2 Timothy 1:5-7) as pastors, teachers, and spiritual fathers who heal, feed, and strengthen God’s people—most importantly through preaching and the administration of the Sacraments. 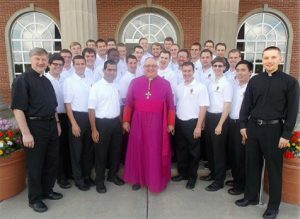 Contact the Madison Diocesan Vocation Office www.madisonvocations.org or email vocations@straphael.org. More information about Holy Orders can be found in the Catechism of the Catholic Church (1536-1600). Because of the shortage of priests within our Diocese and Communities, All Saints Catholic Parish is starting a Prayer for Vocations Program. 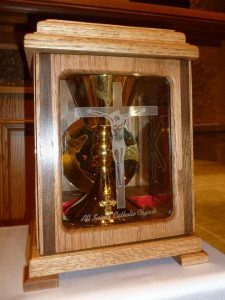 Each Month a few families who signup, will be scheduled to take the Traveling Chalice home to pray over it with their family in hopes to present it to a young man who wishes to enter in Holy Orders as a Priest. If you or your family wishes to put your name on the list to take the traveling chalice home, please call the Parish Office at 920-361-5252 or signup in the gathering space after Mass on the weekends.